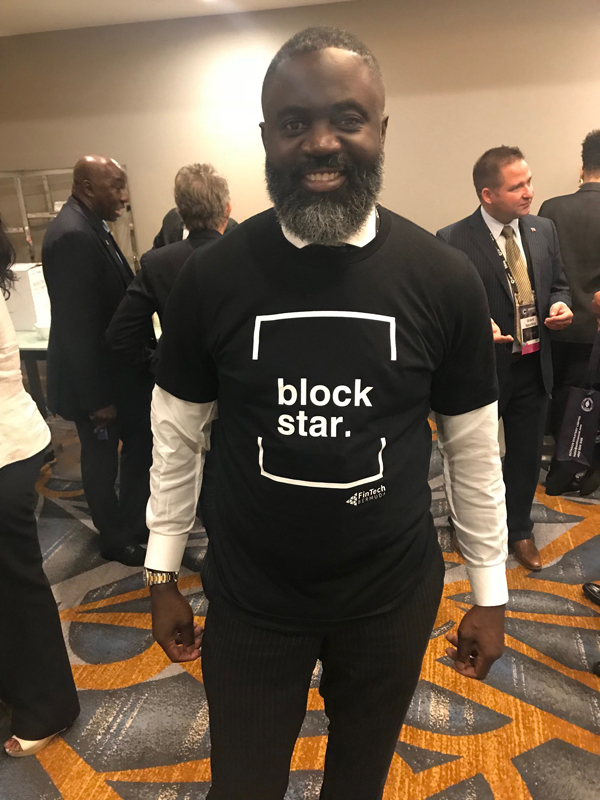 “Bermuda’s pioneering work to regulate the global blockchain industry was praised by delegates to one of the world’s largest cryptocurrency conferences, as New York celebrates Blockchain Week,” the Bermuda Business Development [BDA] agency said. Premier and Finance Minister David Burt, accompanied by National Security Minister Wayne Caines, led a 20-strong delegation from Bermuda to Consensus 2018, a three-day midtown conference running May 14–16 that has attracted more than to 8,000 delegates encompassing a wide array of industries and government entities. The island’s contingent comprises members of Bermuda’s government, the Bermuda Monetary Authority [BMA], the Bermuda Business Development Agency [BDA], and industry, including several Bermuda law firms. 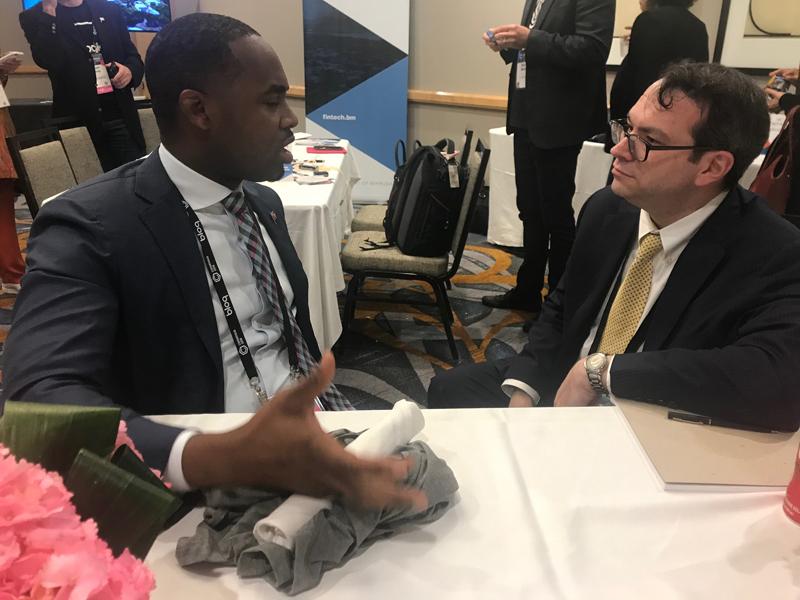 “It’s gratifying to go to an event like the one today, when people already know what’s going on in Bermuda,” said the Premier, who also sat down with BBC Online, Bitcoin Magazine, and Coindesk, a news site specialising in virtual currencies which also organises Consensus. 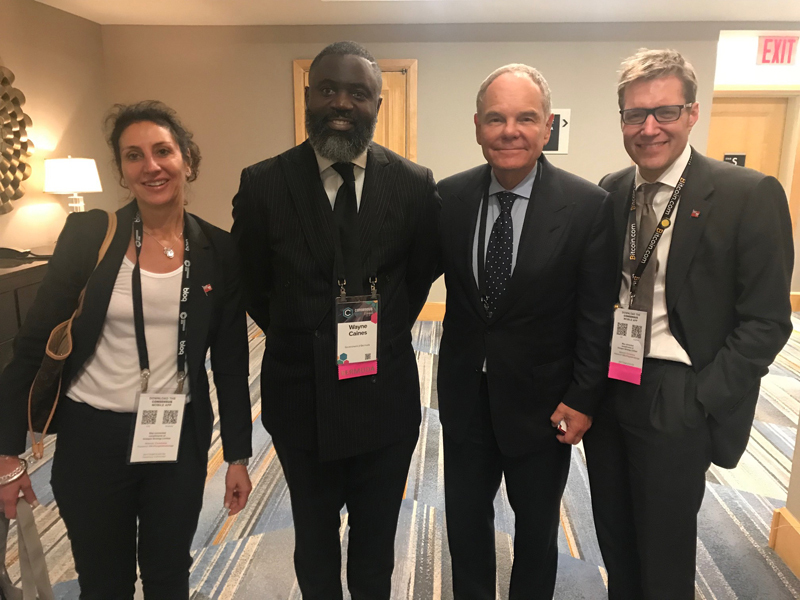 “The government of Bermuda—all the way up to the Premier himself—is showing remarkable leadership in the blockchain space,” keynote speaker, author, and Executive Director of the Blockchain Research Institute Don Tapscott said afterwards. “Bermuda is attempting to figure out an environment that enables both an innovation economy and entrepreneurship, on the one hand, and protecting the interests of consumers and investors on the other. Our institute intends to collaborate much more closely with Bermuda in the future,” said Tapscott, a leading authority on the impact of technology on business and society. 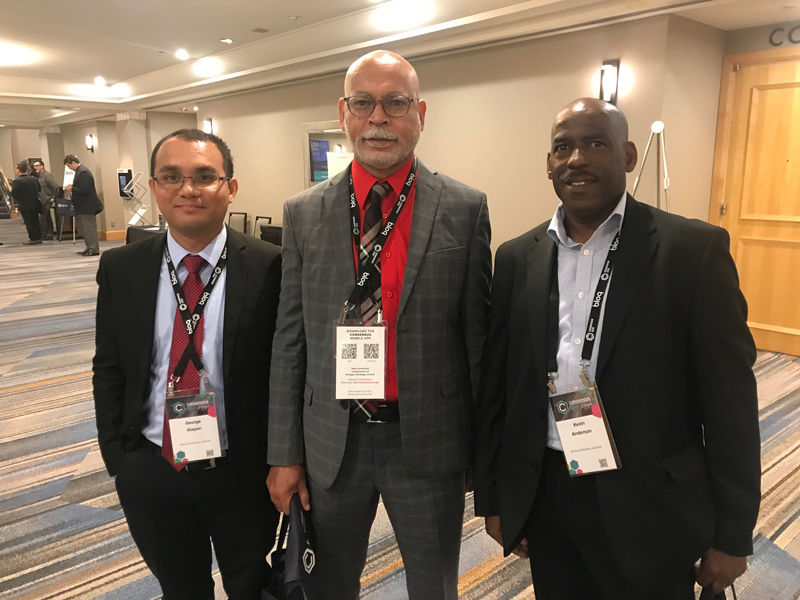 Bermuda delegates were deluged throughout the day by inquiries on setting up businesses and launching initial coin offerings from the island. 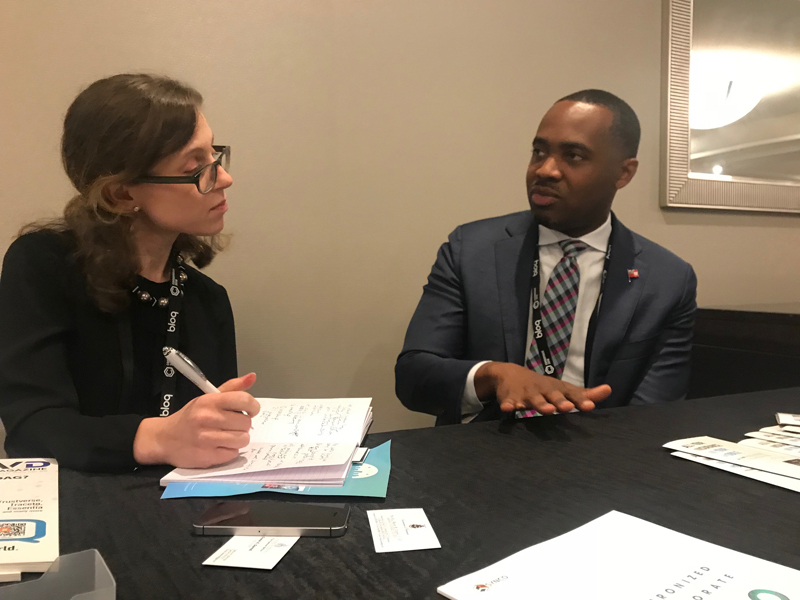 Meetings were held in a Bermuda suite, where a networking reception also attracted entrepreneurs and technologists looking to leverage the island’s respected regulatory environment and sophisticated infrastructure. “It’s impressive to see the volume of people who have come through our meeting suite—since the speech, it has been non-stop,” said the BDA’s Head of Business Development Sean Moran. “I’ve talked to dozens of groups that want to launch their ICOs out of Bermuda, they want to establish service provider companies in Bermuda that would help support the growth of our digital asset industry. Consensus continues today, with the Premier slated for interviews with Nasdaq and Bloomberg Radio, among other media. The Bermuda group will also visit the New York offices of law firm Norton Rose Fulbright to give a presentation on Bermuda’s economy and the island’s innovative approach to business over many decades. 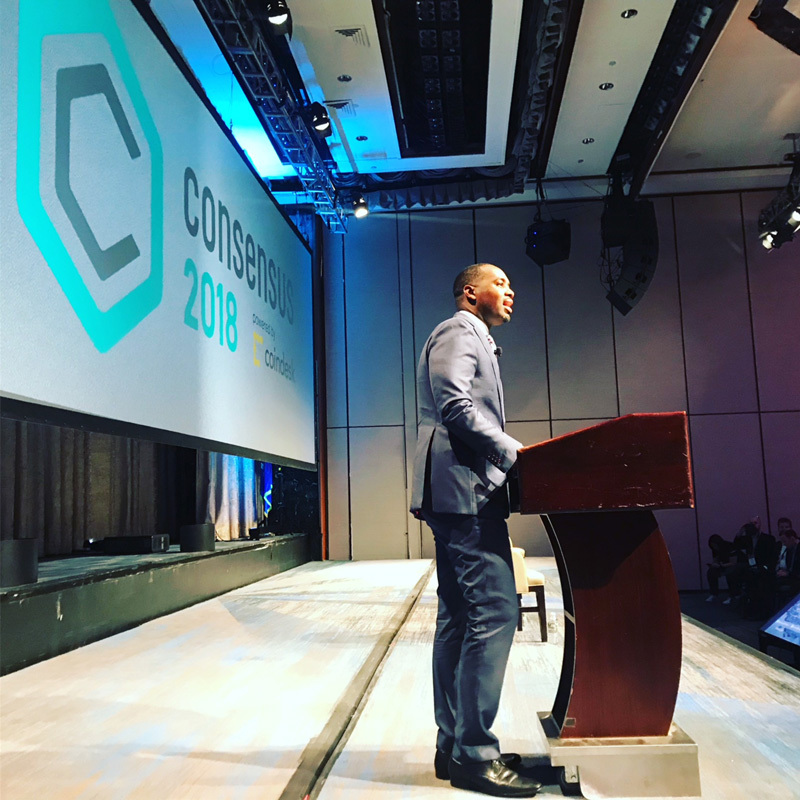 Good morning ladies and gentlemen, I am delighted to be here with you today at Consensus 2018. There is a very real and intense buzz in the air as we each share, listen and learn how those around us are innovating with blockchain technology. As mentioned in the introduction, I run a small country that is a 90-minute flight from New York City. Yes—I said 90 minutes—The drive to the airport is likely longer than the flight to the only place in the world with laws on the books to govern the issuance of Digital Assets. Yes, that is right—I said the first place in the world – as Bermuda is to date the only country to actually enact laws that govern the issuance of Digital Asset tokens. There are a lot of countries that talk about what they are going to do; in Bermuda—we prefer to show, not tell. I will get to that a bit more later—and explain to you the reasons why Bermuda has been able to move so quickly. Today’s panel will discuss regulation and you will hear from a Member of Congress here in the US and a Member of the European Parliament. In order for countries to keep pace with technology, we must continuously update our legislative framework to adapt. This is a difficult balance for a small country like Bermuda, so it is a herculean challenge for the United States or the European Union. Why? Because they are large countries with numerous layers or regulations, whether they at the national level, or sub-national level. You can get two different sets of rules, because what you may be looking to do may fall under federal or local jurisdiction, it may be the domain of the securities regulator, or maybe it’s the financial conduct regulator. Though, in Bermuda, we may have our challenges, we’ve recently made quick progress to become a global hub for fintech enterprises and innovation. We’ve been able to do this because Bermuda is unique. We have been successful in insurance because of our world-class regulator, the Bermuda Monetary Authority, and the link between the public and private sector in designing regulation that works. I see a few familiar faces in the audience from the last place on the Crypto Circuit – Ethereal—so some of you already know that last Friday—May 11—in Bermuda’s Parliament, my government laid the Digital Asset Business Act 2018. This law will introduce a supervisory framework for our financial markets regulator, the Bermuda Monetary Authority, to oversee persons carrying on digital asset business and for the protection of the interests of clients or potential clients of persons carrying on the business of digital assets. This regulation will serve companies that operate exchanges, facilitate payments of virtual currencies, provide virtual digital asset wallets, or who generally issue, sell or redeem digital assets as a business activity. There is no other place worldwide that has introduced laws to provide certainty to the marketplace—only Bermuda has. At the same time, we will introduce a regulatory sandbox that will allow companies to innovate with cutting-edge fintech, while working closely with our regulator to bring these products to market so you can use the Bermuda platform to scale globally. The Digital Asset Business Bill is the second piece of legislation Bermuda has introduced in the last month to provide much needed certainty for companies. The first, as I alluded to earlier, was the industry revolutionizing Initial Coin Offering Act which will provide regulatory certainty for token issuers and protection for customers who wish to participate in an initial coin offering. Most importantly our legislation is broad enough to cover all types of Digital Asset tokens that may be issued. Whether they be a utility token, or a security token, Bermuda has rules in place to ensure that it can be done safely and lawfully from our shores. In Bermuda, we do regulation very well. So, while there can be a lot of travel to conferences and people and countries talking about what may or may not be the case in the future, in Bermuda you have certainty, because we’ve done it. Bermuda is that place where you can leave New York on Monday morning, arrive by noon, meet Government officials, regulators, and our high-quality service providers in the space of a day, have dinner on the beach in the evening, and be back at your desk in NYC by noon the next day. But let’s be clear – if you are a bad actor or have a checkered past, don’t waste your time. Bermuda is not an easy jurisdiction to get into, as we have strict compliance controls to protect against money laundering and terrorist financing, and have extensive due diligence checks on sources of funds. However, once you are in, and continue to abide by our rules, you will have access to the platform that we are building that will power the future. And you will have the seal of approval that notes you have passed the most stringent regulatory checks that exist anywhere in the world. If you don’t follow our rules, our prison does have water views—but it is a prison! Our approach is working, as companies are recognising Bermuda is a serious option. Recently, there has been a string of announcements of companies moving to, or setting up operations in, Bermuda. Over the past three weeks, the Binance Group which is one of the world’s largest Digital Asset exchanges, announced plans to setup their global compliance base in Bermuda. Medy-ci Ventures, a subsidiary of Overstock.com which was formed to incubate, launch, and invest in blockchain investments, announced they will be setting up operations in Bermuda and will use Bermuda as an Innovation Hub. On Friday at Ethereal we announced that OmegaOne, a Consensys Mesh company, will be moving to Bermuda as we look to solve the Digital Asset custody problem. And there will be more announcements we will make over the coming days. In closing, our vision is for Bermuda to be that well-regulated location for technologists and innovators who are building solutions that will power the economy of the future—a future where blockchain technology and the digitization of assets are part of everyday business. There are some countries that have, innovation hubs and accelerators, but there is only one country where the entire island is an innovation hub to accelerate your innovation—Bermuda. I hope that over the next few days, you visit our website fintech.bm or take the time to visit the Bermuda suite located downstairs in Concourse E so you can learn more about what we have to offer and experience the Bermuda difference by talking directly with our Government officials, our regulator, and our service providers in one place. Thank you, and I look forward learning more, and hopefully welcoming you to Bermuda in the near future. Why all this intense focus on this subject? I still don’t know how block chains and bit coins are meant to help Bermuda as a whole. I hope this government is focusing on other matters too. I think I could learn to like politics. Flying around the world making noise about ideas without ever having to produce a result. What a change from my real job where results are key to keeping my job! Well, Dave.com sees it as a an opportunity to raise some much needed revenue. It won’t create significant demand for goods and services in Bermuda, to drive a population increase that is really the only way forward to get us out of the hole that the PLP themselves created. He’s lucky, as he’s on Bob’s coat tails at the moment and he has to continue that steady work. His real challenge however, is that he’s surrounded largely by idiots. Why isn’t Jamahl spearheading this with the premier.He is the minister of economic development.Caines needs to tackle all the anti social behavior,or has he left that to ya boy Bean. I, I, I, me, me, me, my, my, my. I’m looking forward to closing the pay gap. I want to earn the same as the Premier and be paid for flying around doing photo ops. Blockchain is a new technology , that is believed to help businesses like, Banks, Insurance , Real Estate and the small man ,etc,etc. Additionally , Blockchain seeks to help companies to raise money through ,”Crowdfunding ” . This would allow a start-up company to by pass the banks with all it’s regulations in order to get their product to the market before their competitor . The period between 2008-2017 , has not been one friendly towards small businesses and entrepreneurs in Bermuda. We are on the cutting edge of innovation .You are either a part of it, or you will get left behind . Proceed but Verify . Banks wont touch blockchain. Hope everyones “digital” assets are secure. Lmao. But considering this admins fondness of dishonestly. Crypto seems to fit right in with their agenda. Oh ya. Bus schedule fixed yet burt? Blockchain technology is over 20 years old. Created by a group that called themselves Cypherpunks. Blockchain isn’t all it’s suggested to be. The big Banks, Insurance , REITS are testing it but not sold yet. Any blockchain code they implement is proprietary & they haven’t needed a ico yet to do any of it. 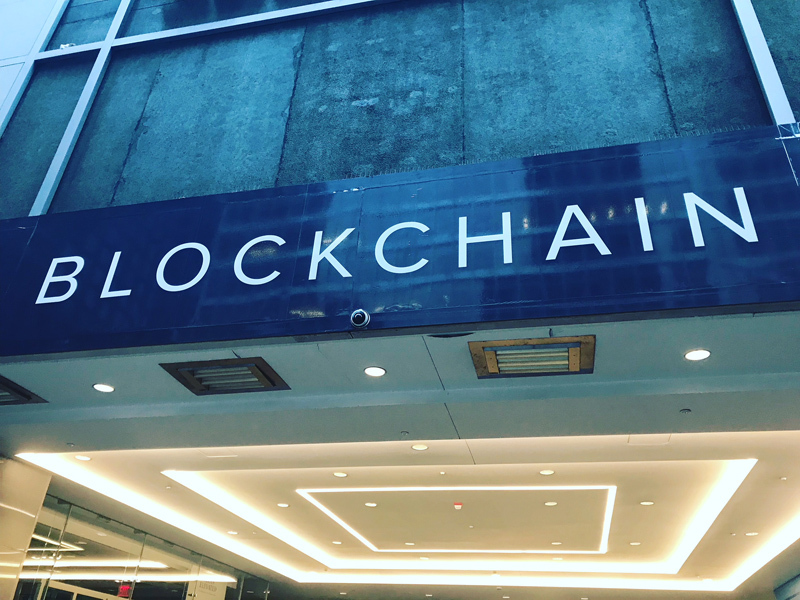 They hire a REAL blockchain company that lists on a REAL EXCHANGE to set it up. These icos are just novice trying to make some quick cash off others. You don’t need blockchain to crowdfund. That’s been going on before computers existed. Banks have all their regulations for a multitude of reasons. Keeping investors safe from ponzi schemes is a big one of the reasons. There’s no way to keep someone safe from an ico ponzi scheme. You are in for a big disappointment. This is straw grasping at its finest. How about helping Born Bermudians in YOUR OWN COUNTRY first before jetting off to be with others about some silly blockchain BS. FIX THE F$%$%# SCHOOLS AND FIX OUR ISLAND! WHERE’S THE JOBS???!?!?!?!?! PLP helping born Bermudians? LOL! That’s the joke of the day. They didn’t help Born Bermudians back in 2007 when they approved thousands of menial jobs work permits & declined the ones for exempt company workers. They brought in all the foreigners they protested against OBA’s PRC immigration law change for. PLP just goes on pretending & the zealots keep on believing. Bermudians wont get a job in Bermuda from blockchain but PLP’s new found friends will. I dont intend on being mean but don’t you know by now that NO political party can fix what you re asking for? We are at the mercy of external forces and there NOTHING anyone in Bermuda can do. Just sit back and wait for others to give you a JOB? how’s that working out for you? Government is there to create the environment for jobs potential but many think that means you will just be given a JOB. The more potential we have the more opportunities. Wish the Government success and stop whining about jobs. They will come if we create the right environment for them. But at the end of the day we need more PEOPLE FROM OVERSEAS to work here as they bring disposable income and help us with the tax burden to run our Island. But problem with some Bermudians is they don’t think that way! They get all emotional and shattered when too many people want to buy houses, startup businesses and fund private schools. OMG get over it! If … can help us with renting our houses, use our taxis and pay some of our bills including charity support then what’s wrong with that? Surprised Caine’s is not wearing a “landslide 24 12 “ t shirt . This is bad. 90% of ICOs have been proven to be scams/fizzled out and failed and now our Minister of Finance AND Minister of Security are going to run one with what money?!?! Blockchain, Crypto , Bitcoin = Egg on you face,, Burt and Co.